Many flowers cannot produce seeds unless pollen is carried from the male part of a flower to the female part. This process is called Pollination. Without pollination, most wildflowers would not be able to produce new seedlings and gradually these flowers would disappear from our bushland. Without pollination, many crop plants would not be able to produce the fruit, vegetables, nuts, seeds and oils which are an important part of the food we eat. Pollination is vital for the survival of most of our Australian wildflowers and many of our food crop plants! Pollen grains from the male part of a flower must be carried across to the female part of the flower. The pollen grains are usually carried by the wind or by bees and other insects. 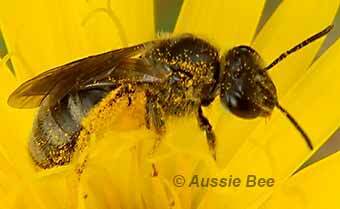 This Leioproctus native bee has packed pollen grains onto special hairy pads on her hind legs. When she visits the next flower, some pollen will rub off onto the flower, pollinating it. Bees are particularly good pollinators because they need pollen to feed their young in their nests. During the day, bees visit hundreds of flowers to collect this pollen. Each time that they fly off to another flower, they leave some pollen on the female part of the flower. This pollinates the flower and helps the plant to produce seeds. It is a Win - Win situation for both the plant and the bee! 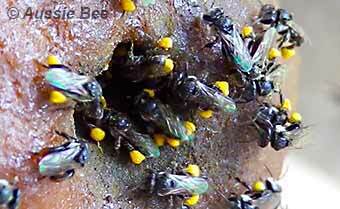 With Eucalyptus trees in bloom nearby, these native stingless bees are enthusiastically bringing large balls of yellow pollen home, into their nest in this hollow tree. The pollen is used to feed the immature bees inside the nest. Many native bees visit a wide variety of flower species. However, Australian native bees have evolved in parallel with our wildflowers for millions of years. So it is not surprising that some native bees have developed very special ways to pollinate particular wildflowers. Some native bees have evolved long tongues that can sip nectar from deep narrow flowers and others have specialised bristles that help them collect pollen. 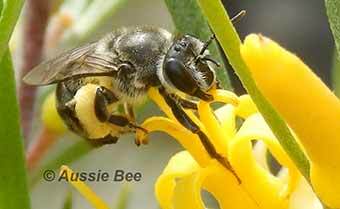 For instance, Persoonia Bees, Leioproctus (Cladocerapis), are specialist pollinators of the Persoonia or Geebung flower. Persoonia Bees have shiny smooth faces that help them reach deep into the flowers for nectar and they have dense bristles on their forelegs that they use to rake pollen out of special grooves in the flowers. 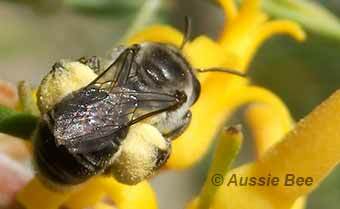 This Persoonia Bee is raking pollen from a Geebung flower using her front legs. She has coarse bristles on her front legs to help her do this. You can also see the shiny smooth plate on this bee's face that helps her slide her face between the flower's petals to collect nectar. It is important to protect the diversity of our native bee species, so that we will always have bees to Buzz Pollinate our wildflowers! For some major food crops such as wheat, rice, corn and oats, wind carries the pollen that pollinates the plant. -- coffee, coconut, mustard and cotton. Just one species, the European Honeybee, Apis mellifera, is currently used for large-scale commercial crop pollination in Australia. This is a serious problem, because European Honeybees are under threat by many pests and diseases. 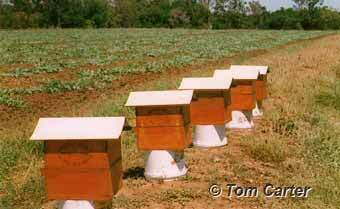 If (or when) Australia is invaded by the devastating Varroa mite, we will lose a large proportion of our European Honeybees. However, for some food crops, Australia's 1,700 native bee species can be better crop pollinators than European Honeybees. For instance, many solitary native bees carry large amounts of dry pollen on their furry bodies, making them particularly efficient pollinators. Our social native Stingless Bees have a short flight range that helps keep them within a target crop or inside a crop greenhouse. And Blue Banded Bees and Carpenter Bees can perform the special Buzz Pollination technique needed for crops such as tomatoes, capsicums and blueberries. A Bluebanded Bee Buzz Pollinating a tomato flower inside a greenhouse. European Honeybees cannot perform Buzz Pollination. The best result is achieved when European Honeybees and a variety of native bee species are used together to pollinate crops. So it is vital that we learn how to make better use of our wild pollinators for crop pollination in Australia. Major research programs on this subject are currently underway in New South Wales and South Australia. 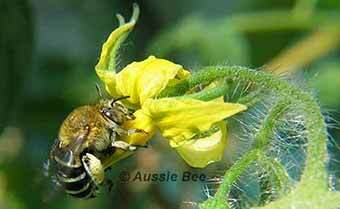 Read more about Crop Pollination with Australian native bees. A solitary Lasioglossum bee with dry pollen grains caked on her hind legs and across her back. Dry pollen grains transfer readily to the female parts of flowers, making the process of Pollination easier. So these kinds of bees can be excellent pollinators. Our Australian native bees, which provide such essential pollination services, are under threat from the spread of our cities, broad scale agriculture methods and insecticide use. Gardeners can help support these vital pollinators by planting a Bee-Friendly Garden, by avoiding the use of insecticides and by setting up Bee Hotels. Farmers can help by allowing wildflowers to grow on strips of land beside their crops or roads. This can increase the number and diversity of wild pollinators visiting their crops and so increase the crop yield.